At last! A bit of sunshine, to lighten the gloom and lift the spirits! All this wet and windy weather recently, has well and truly dampened the spirits, so, with a bit of welcome sunshine, the walk round the estate was much more pleasant, and I’m pleased to say, not so rushed. O.k., here, it may still be cold and very blustery, and not conducive to dallying for too long, but it was a pleasure to wander, and to take time to enjoy the new season’s offerings. And that’s hellebores and snowdrops. What better way to rejoice in the sunshine than to share with you, my aptly named hellebore, shown at the top. An Ashwood hybrid, from the “Sunrise” range. It has the most wonderful warm shades of yellow, peach and red – unusual colouring in a hellebore. 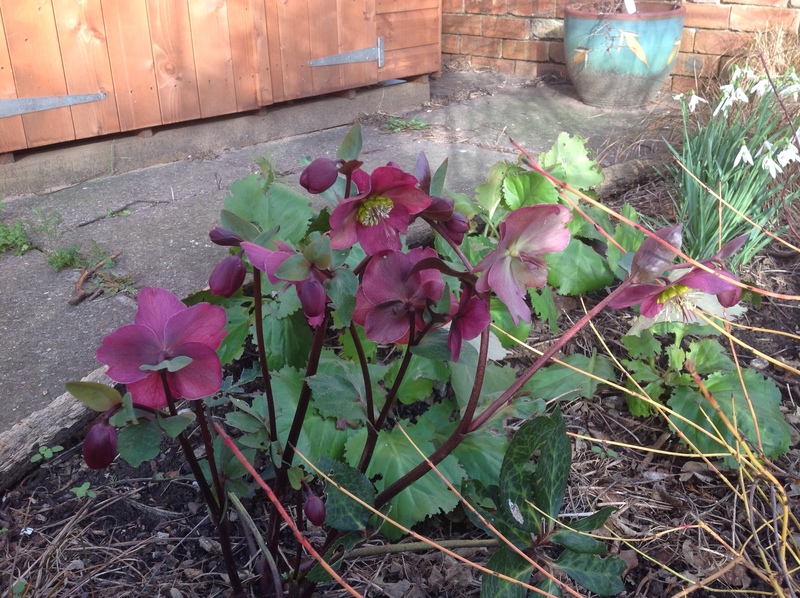 Talking of red, just look how my Hellebore “Anna’s Red” has come on, since the early buds I showed at the end of last year. 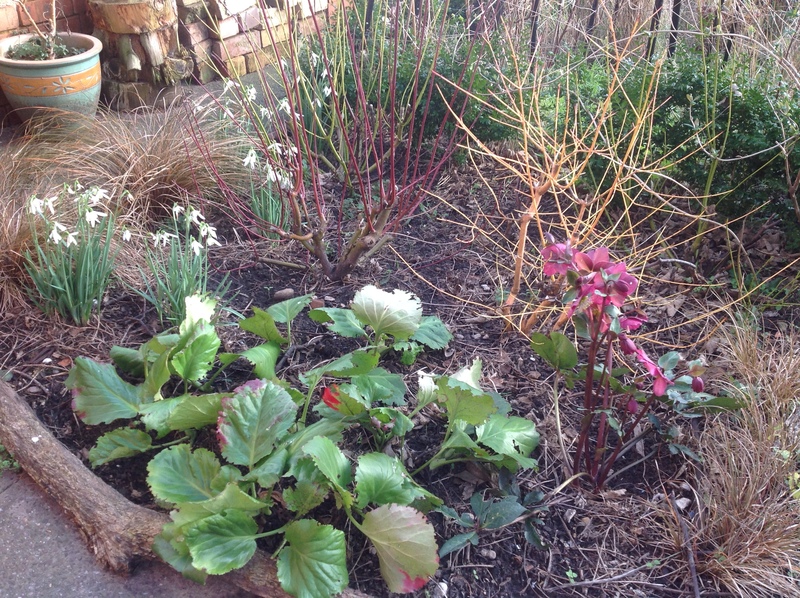 I think it looks quite at home in “The Dogs Bed”, alongside the complementary coloured stems of Cornus and the expanding clumps of Snowdrop “S. Arnott”. 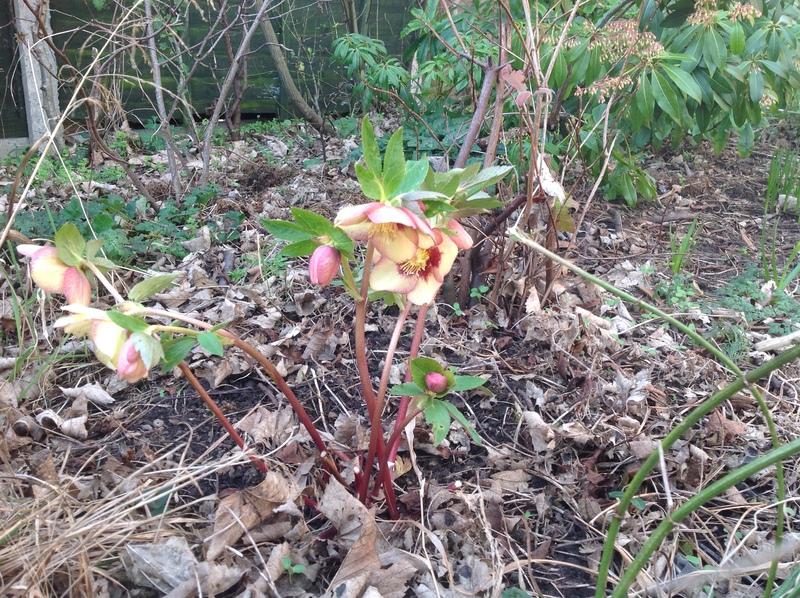 Other hellebores are starting to unfurl now, in varying shades of white and pink. Give them a few more weeks and they’ll make a pretty picture, when the “February Gold” narcissi start to open and new green shots emerge. I took time to survey the borders (i.e. do a lot of thinking!) to try to work out the changes I am considering. I do fear I may be trying to squeeze a quart into a pint pot! Let’s hope I can be disciplined! 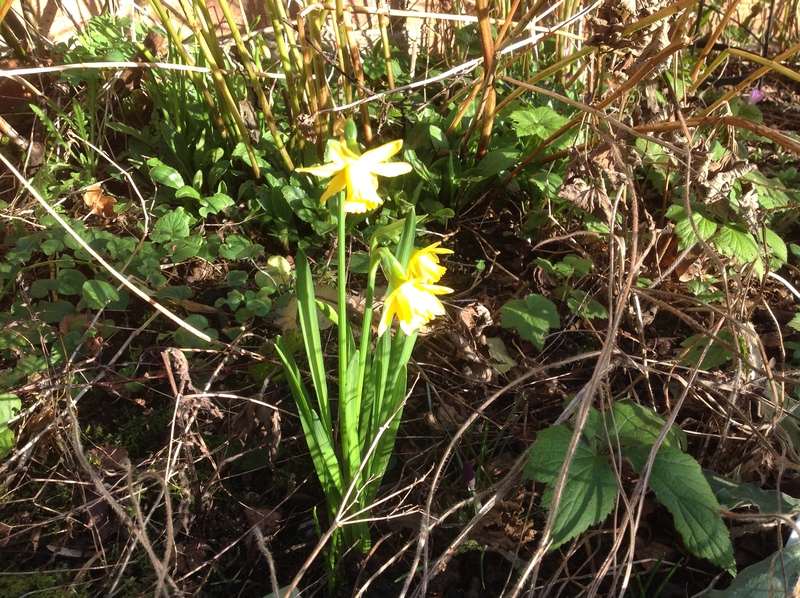 And what can bring more sunshine than the earliest of yellow narcissi? Is anything bringing sunshine to your gardens? This entry was posted in Uncategorized and tagged Dogwoods, Hellebores, Narcissus, snowdrops on February 2, 2016 by thelonggardenpath.